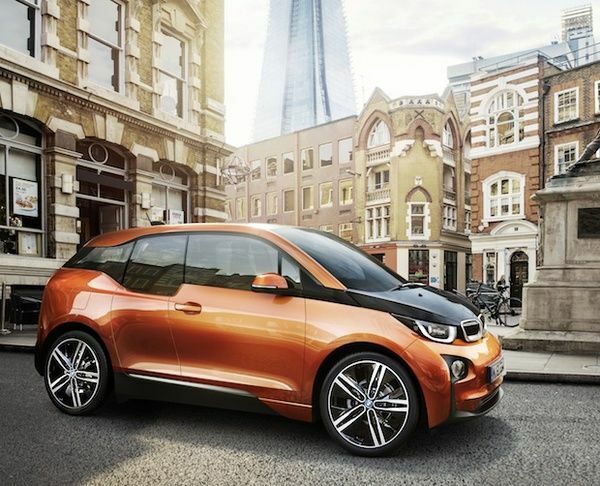 The BMW i3 won't even be on the market for a year, and it's already won an award. Today, the Next Green Car website declared the BMW i3 the best "SuperMini" car among a roster of winners that included the Nissan Leaf, Volvo V60 Plug-in Hybrid and Tesla Model S.
The Next Green Car website is largely a database of car specifications and information, that helps readers sift through which are the cleanest. The focus is on the United Kingdom market. The cars which won the Next Green Car Awards 2013 were ranked on both Carbon Dioxide output, and a Green Car Rating score developed by the websites editors. The GCR takes into account many factors and attempts to be an assessment of the lifecycle emissions – not just those from the exhaust or 'tailpipe'. This includes all air-based emissions, an accounting of the impact of fuel production and transportation, as well as the extraction and production of minerals that make up automobile components, and more. A low GCR score is better than a high one. Supermini: BMW i3 electric – CO2: 0 g/km – GCR: 23 (11) NGC verdict: "The BMW i3 is set to change what we expect and demand of an electric urban vehicle; one that maximises electrification, connectivity, quality and driving performance." This would be the electric version of that car, not the extended range version. The BMW i3 will be sold in two varieties, one being an all electric with 80ish miles of range. An extended range version for a bit more money will include a small gas engine in the rear that will act to maintain battery charge when it runs low. Small family car: Nissan LEAF electric  – CO2: 0 g/km – GCR: 26 (13) NGC verdict: "A high quality family electric vehicle, the new LEAF offers best-in-class range and versatility. With multiple buying options, it's never been so easy to own an electric car." The Nissan Leaf is the best selling all-electric car in the world, with over 100,000 sold world-wide since its inception in December 2010. Large family car: Volvo V60 Plug-in Hybrid – CO2: 49 g/km – GCR: 43 (TBC) NGC verdict: "Ticks all the boxes for a high quality, well-built, efficient family car for the here and now; but more importantly also looks to the future with its innovation and vision." The V60 PHEV is a diesel plug-in hybrid station wagon that will be built, initially, in small numbers. Executive class car: Tesla Model S electric – CO2: 0 g/km – GCR: 31 (16) NGC verdict: "The pin-up of the electric vehicle world, the Tesla Model S combines a ladle-full of executive gadgeted luxury with a futuristic electric driving experience." The Tesla Model S is storming the luxury car market with strong sales and top accolades from magazine to magazine. NGC verdict: "A high quality but affordable electric city car, the all new e-Up! offers compact comfort with zero emissions. With VW's brand and backing, the e-Up! could be the catalyst for a step-change in urban electric car adoption." If it ever goes into production, the VW e-UP is a micro-sized urban car that could fit well with the hyper-densely populated cities expected in the future.